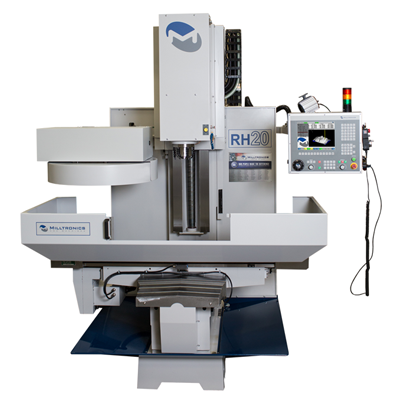 Milltronics milling machines meet today’s needs for higher speeds, tighter tolerances, rock solid reliability as well as maximum value for greater profits. However, it’s our people make the real difference through their focus on quality manufacturing and unsurpassed customer service. Using the highest quality components Milltronics’ skilled craftsmen build performance and reliability into every machine. It makes our machines comparable to those costing twice as much and able to deliver the highest return on your investment. Every Milltronics CNC machine comes from people who care about what they build, how they build it, how they support it and ultimately, the success of their customers. Travels 40 x 20 x 24"
Table Size 54 x 16"